This is an extremely scarce pocket map of the cradle of the Civil War published in 1861 by D. Appleton. 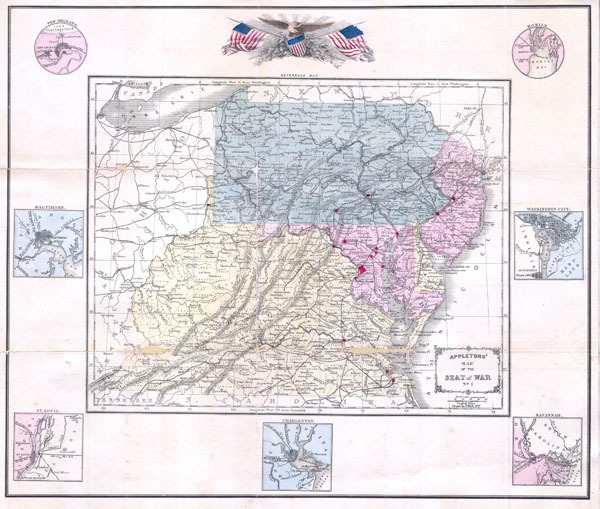 Depicts the states of Pennsylvania, New Jersey, Maryland, Delaware, Virginia and parts of North Carolina. Highlights major cities in Red. Surrounded by seven city plans: New Orleans, Baltimore, St. Louis, Charleston, Savannah, Washington D.C. and Mobile. At the top of the map is a noble American Eagle presiding over a tilted armorial shield and two American Flags without stars. Designed to provide education and illustration regarding the major playing field of the Civil War. Folds into pocket format for easy reference. The basic cartography for this map is pulled from Sarah S. Cornell's 1859 Cornell's High School Geography, also published by Appleton. The map itself was drawn by F. Wells of New York. Good condition. Reparis on original folds. Professionally flattened. Original paper binder included but split at spine. Rumsey 0197.013 (Cornell's School Geography). University of Delaware, Special Collections, 03008 h.